When it comes to auto repair services in Crossroads, nobody beats Firestone Complete Auto Care. Schedule an appointment for quality car or truck repair today! Looking for one of the best Crossroads auto repair shops? You'll find it at Firestone Complete Auto Care near you. Cars need routine maintenance and preventative fixes in order to run strong for 200,000 miles and beyond. Plus, catching small problems early on can help prevent big ones down the road, which can save you time and trouble. Some signs are unmistakable, like a flashing check engine light or smoke coming out from under the hood. Other times it can be can be tough to know that your vehicle needs a repair or service, however, there's one thing every driver knows: when your car isn't driving right! Thankfully, you can turn to the experienced technicians at your neighborhood Firestone Complete Auto Care to help keep your car tuned up and driving its best. Stop by your nearest auto and truck repair shop in Crossroads and we'll start with a courtesy checkup. Highly trained technicians will thoroughly look over your brakes, tires, battery, belts, hoses, wipers, safety lights, and more, all in order to solve your car problems. The best car repair can't happen without the right expertise! After our techs are done, we'll give you a complete rundown of your vehicle's condition and talk to you about any repair services that may need to be performed. With almost a century of car care experience, we know what it takes to reach peak vehicle performance. From tire alignment to brake pad replacement, flat tire plugs to transmission tune ups, our professional technicians do it all. We're the place to go for auto repair in Crossroads! We believe in customer satisfaction and safety above all else. That means two things. One, we'll only recommend repairs that are absolutely necessary. Two, the services we perform will be fixed right the first time. And that’s a guarantee, backed by our Triple Promise – a promise that every job will be Fixed Right, Priced Right and Done Right on Time. That's the way we do business! So whether you've got unusual sounds, worrisome leaks, or your car just isn't performing like it used to, schedule an appointment at your local Firestone Complete Auto Care for quality advice and sound auto repair in Crossroads. When your car goes farther, so do you! 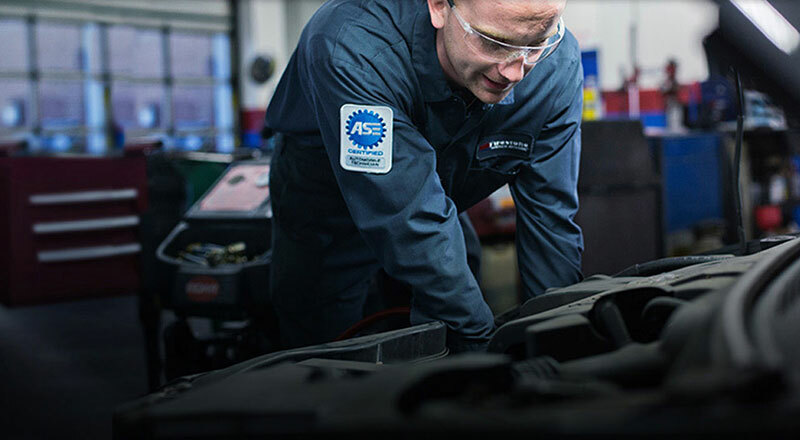 From transmission work to steering and suspension to headlight replacements, head to a Firestone Complete Auto Care near you for your automotive service needs. We're your go-to tire store, service center, and repair shop. Our professional technicians work hard to help ensure that your vehicle runs the way it should. When you bring your car or truck to us for maintenance, we promise affordable prices and exceptional service. Experience the difference! Make an appointment for auto service in Crossroads, Texas today.